For one particular group – the armed forces – it’s easy to see why armored vehicles are a necessity. From armored Hummers to the most heavily armored vehicle of them all, the modern tank, operating in combat zones obviously requires the utmost in physical protection for soldiers. 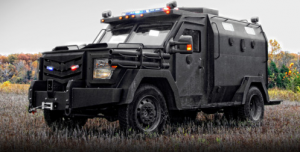 But most people aren’t aware of just how many other kinds of organizations use armoured vehicles routinely, and how many different kinds of armored cars and trucks are available today. Even many businesses and organizations are unaware how they could benefit from adding armoured cars and armored trucks to their vehicle fleets. Armored vans, trucks and cars serve an essential purpose wherever and whenever people, money and property might become the targets of violence or theft. Diplomats, business executives and celebrities regularly travel in armored and bulletproof automobiles, ranging from armored limousines and SUVs to less conspicuous armored sedans. Cash, precious metals, gems and jewelry, other valuables and important documents are safely transported to their destinations in armoured vans and armoured trucks. Unless someone has served in the military, the only armoured vehicle her or she is likely to have noticed is the armoured truck that’s parked from time to time in front of the bank when cash is being picked up or delivered. Such cash-in-transit vehicles service not only financial institutions per se but also ATMS, check-cashing firms, grocery stores, pawn shops, casinos and even events such as fairs and outdoor festivals where large amounts of cash are taken in as admissions. Even with the trend toward a supposedly “cashless” society, there is still plenty of coin and currency that needs to be transported securely! For that matter, the items that commonly take the place of cash such as debit cards, credit cards and gift cards need to be kept secure while they’re being moved between the places where they’re manufactured and their points of distribution. When it comes to protecting people from harm, armored vehicles can be intended to keep their VIP passengers safe from people on the outside – or sometimes vice versa. An example of the latter would be the armored buses and vans that are used by all levels of law enforcement to transport prisoners. People traveling a little more “voluntarily” in armored vehicles include anyone who needs protection from attempts at assassination or kidnaping – heads of state and other high government officials, corporate executives, celebrities, religious leaders and royalty. While usually the people facing threats are the rich, famous and powerful, armored vehicles also protect people such as witnesses and juries in high-profile trials, aid workers in dangerous areas of the world and journalists in war zones or unstable regions. Police increasingly use armored vehicles to deal with law enforcement situations in which ordinary patrol cars can’t provide sufficient protection. Armored SWAT vehicles are taken into situations in which high-powered weapons or explosives might be used to attack officers, and armored police vehicles are used today in many countries for riot control or prevention, hostage situations and to serve arrest warrants in high-risk situations. The Armored Group LLC has been manufacturing state-of-the-art armored vehicles since 1992. We sell and service a wide variety of new and used armored cars, trucks and vans for military and non-military clients around the world. At the Armored Group, we pride ourselves on using our expertise in the field of security to deliver both excellent customer service and quality products. To discuss your organization’s armored vehicle needs, please contact us.